A caricature makes birthday and buck’s party events special because they add an extra fun element to any gift. Often caricatures are ordered with the intention of having them printed nicely as birthday gift ideas and perhaps even beautifully framed or printed onto canvas. 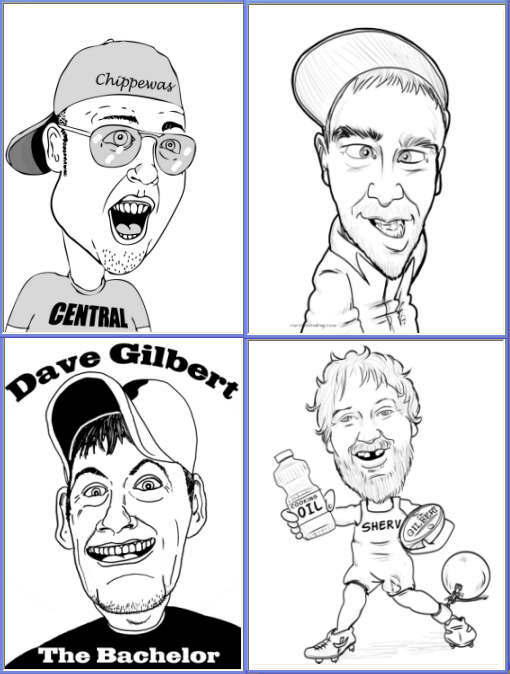 These are great ideas and we have many, many happy customers who receive caricatures as gifts. However there is an immensely fun subculture out there who know the fun that can be had from using the caricature a little differently. In this case, putting a caricatureon a t-shirt for the special person to wear (or in some cases a whole bunch of people if a buck’s party of a boy’s ‘road trip’). Here is a great example of one used for a birthday event and some earlier ones. Very cool and funny – perfect for the occasion! To be able to make use of caricatures as a central theme for a big birthday or buck’s party or even a mate’s road trip shows real imgination and commitment. It is not overly expensive and having people wear their art either as part of a birthday art gift or gag tshirt at a buck’s party really lifts the spirits of everyone!